"Choice" was the rule as the AustinSushi.com team descended on Sushi Zushi Monday night. With waiters sporting "Sushi is Going Weird" t-shirts (a riff on the "Keep Austin Weird" non-slogan), the sushi bar seemed upbeat. This is the 6th location for the San Antonio-based sushi bar chain and the 1st Austin location (4 San Antonio locations and 1 in Dallas). With a menu sporting around 200 items, you can pretty much have it your way, and, even if many of the choices have cream cheese or mayonnaise (not my favorites), you can easily add or subtract ingredients from any of their 100 or so custom and traditional sushi rolls. 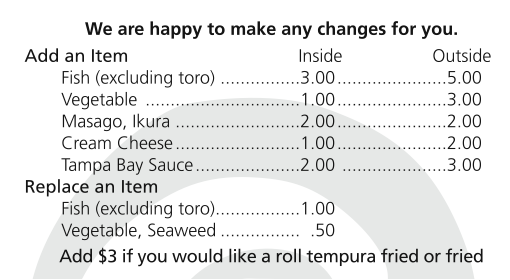 They even provide a handy pricing guide on the menu for making those changes, including the option to tempura deep fry any roll. Ambiance-wise, the upscale-ish operation has the feel of a mature sushi bar with a fair amount of table/booth seating, and a semi-private room that seats around 30. A separate take-out/delivery entrance and register (an Austin first for a sushi bar?) should speed the handling of those orders without interrupting the flow of traffic to the main sushi bar. They've also done an interesting job of automating things by letting people order takeout online and make table reservations via OpenTable.com.